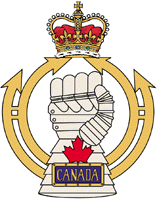 Status 1 January 2000: Active branch of the Canadian Forces. The Royal Canadian Armoured Corps was created in 1940 as an adminstrative corps. The Canadian Armoured Corps was authorized on 13 August 1940, and created as an administrative organization to hold reinforcements for armoured regiments in Canada and overseas. After the Second World War, the Corps comprised all armoured and reconnaissance regiments and other armoured establishments. The authority for the corps came from General Order 250/40 effective 13 August 1940. A Corps Headquarters, Canadian Armoured Corps, CASF was mobilized 13 August 1940 as well. As the role of armour was expanded dramatically during the Second World War, the former Tank regiments, which were considered Infantry units, were redesignated as armour, as were many cavalry regiments and eventually infantry1 regiments as well. Lists of armoured regiments can be found in other articles on the website. In 1940, coloured backings were adopted throughout the Canadian Army for officers' rank insignia. The corps adopted a yellow backing colour, and retained that colour until Unification, changing to a St. Edward's Crown after the ascension of Queen Elizabeth II to the throne. 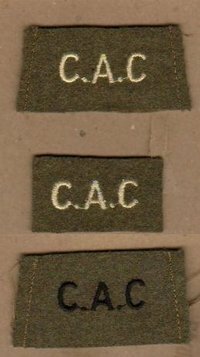 Sergeants and Warrant Officers in some CAC/RCAC units wore a cap or collar badge in conjunction with the rank badges worn on the right sleeve. See the article on NCO Corps Badges for more information. In front of two concentric circles barbed at the top, a dexter mailed gauntlet clenched erect charged at the base with a nameplate and inscribed with the word CANADA. Above the nameplate a stylized maple leaf, the whole ensigned by the St Edwards Crown. A new badge adopted later depicted a mailed gauntlet for the right hand, with fist clenched palm to the front with a billet on the wrist inscribed RCAC; issuing from the wrist upwards, two concentric circles, broken and barbed at the top representing one of the roles of armour on the battlefield; the whole surmounted by the Crown. The crown was originally a Tudor Crown and naturally changed in 1953 with the ascension of Queen Elizabeth II to the throne. The inscription on the billet changed in 1970 to read CANADA as RCAC was an English designation. 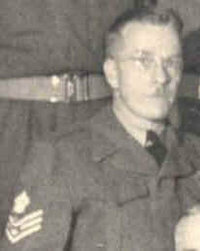 After the introduction of Battle Dress in 1939, Slip-on Shoulder Titles were worn in the early years of the war, with Reserve units in Canada possibly retaining them longer than Active units. Bill Alexander photo. 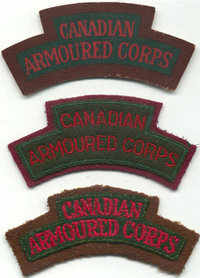 The cloth flash at left was worn during the Second World War by soldiers in training; it was also seen in use in the 5th Canadian (Armoured) Division in conjunction with Formation Patches bearing unit titles. A flash in corps colours (yellow and red) was adopted after the "Royal" prefix was granted in 1945. After the 1936 re-organizations, additional types of infantry regiments were added to the army's order of battle, including Tank and Machine Gun battalions. 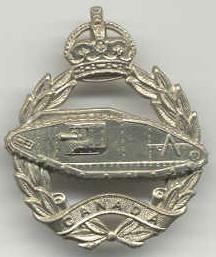 Badges of the Canadian Forces, Canadian Forces Publication 267 (Department of National Defence, 1976). 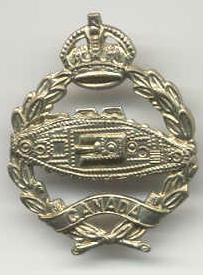 The image provided in the CF publication has the word ARMOUR on the nameplate, despite the description, which says CANADA in the text.